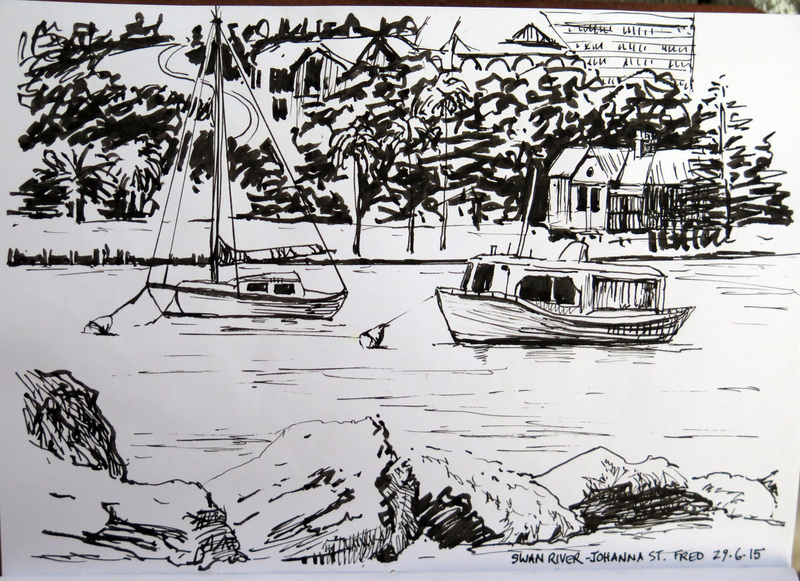 Met with the outdoor painters again today at Johanna Street, North Freo, lovely sunny spot next to the Swan river – the “Left Bank” pub across the water. It was surprisingly warm for winter (24’C) and there was no breeze sheltered down behind the traffic bridge. A few canoeists and small boats on the river, people walking dogs otherwise it was very quiet. There was an orange dingy half in shade from overhanging trees. 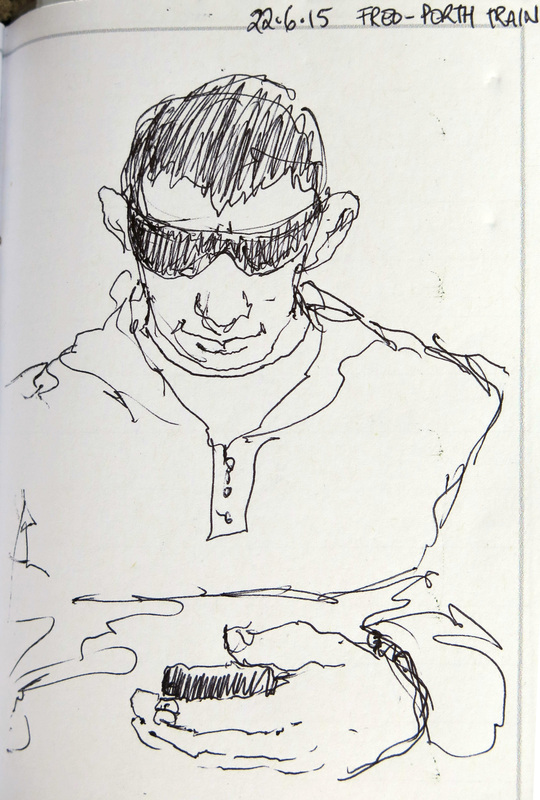 The second sketch was more an experiment with the fude fountain pen to see what works (and doesn’t). 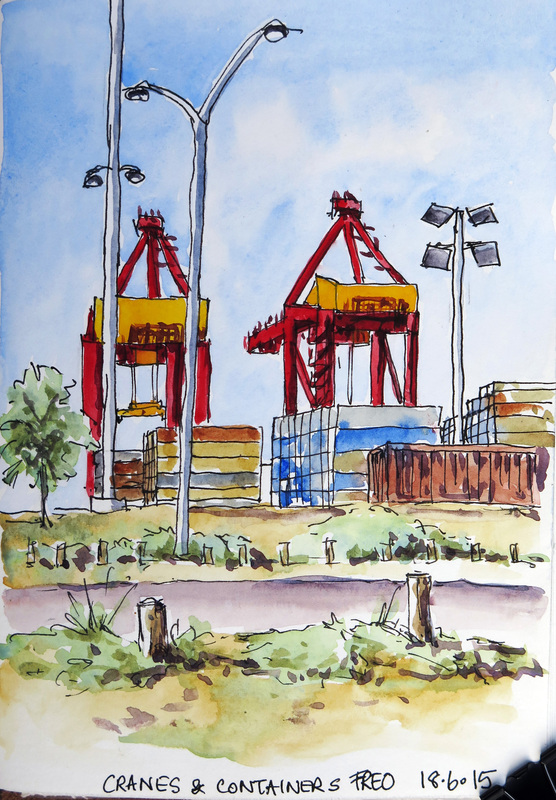 Driving home from an art class at Fremantle Arts Centre I stopped at Leighton Beach to do a quick sketch of the iconic “Dingo Flour Mill” which was glowing in the winter sunshine. The wikipedia entry reads…. 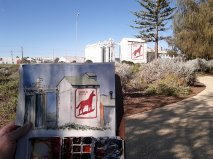 “The Dingo Flour sign is a well-known landmark of a stylised silhouetted dingo in red on the side of an historic and heritage-listed working flour mill in North Fremantle, Perth, Western Australia. The mill is in a complex known as the Great Southern Roller Flour Mills Limited. On the site (which dates from 1922) are silos, an office and laboratory and other buildings. The Heritage Council of Western Australia says: “…the place has a landmark quality with strong vertical proportions, height and massing of the mill and silo structures, the Dingo Flour brand image, and the Norfolk Island Pine; the place has been commonly referred to as ‘Dingo Flour Mill’ for many years, showing the impact of the symbol, and has developed its own set of myths, including that it was painted by Alan Bond, demonstrating that the ‘dingo’ contributes to the community’s sense of place…” The mill was designed by architect J.F. Allen, of Allen and Nicholas, and the office building was designed by Powell, Cameron & Chisholm Architects. The sign and the rest of the site was heritage-listed in 2008. The dingo logo was painted by artist Les Nash in 1940 for £40. It is about four storeys high. It was painted over during World War II, but its outlines were still faintly visible. Refugees and migrants coming to Fremantle saw the sign, and it remains a useful reference point for boaters and anglers. It was most recently re-painted in March 2001. 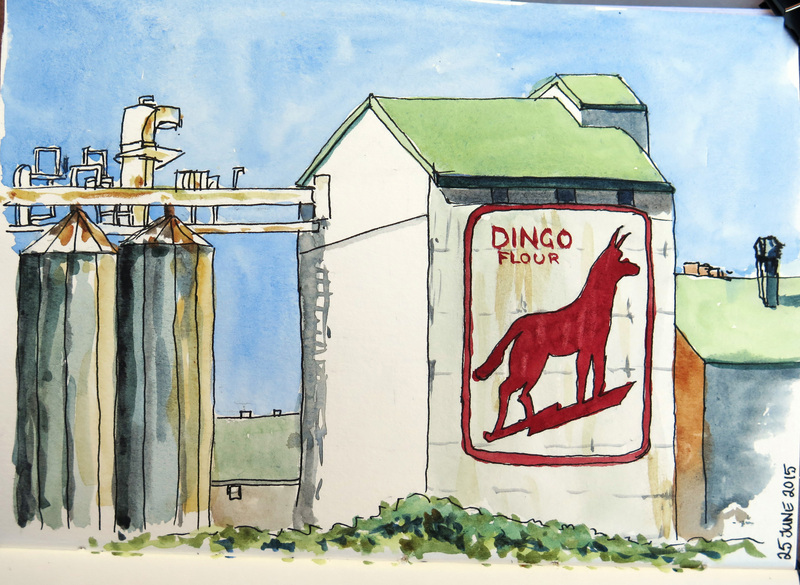 In 2010 the flour mill was renovated, and the dingo now gets re-painted every month. The front of the mill is due to be completely replaced soon as it has corroded so badly after decades in the salty air, but it will be rebuilt anew with the dingo restored to pride of place. The outdoor group met at Fremantle’s Shipwreck Galleries this morning (the “outdoors” was too cold, too wet and too windy so we hid inside the warmth of the museum.) Lots of relics from ships wrecked along the West Australian coast, in particular a large section of the Batavia and various Dutch ships. 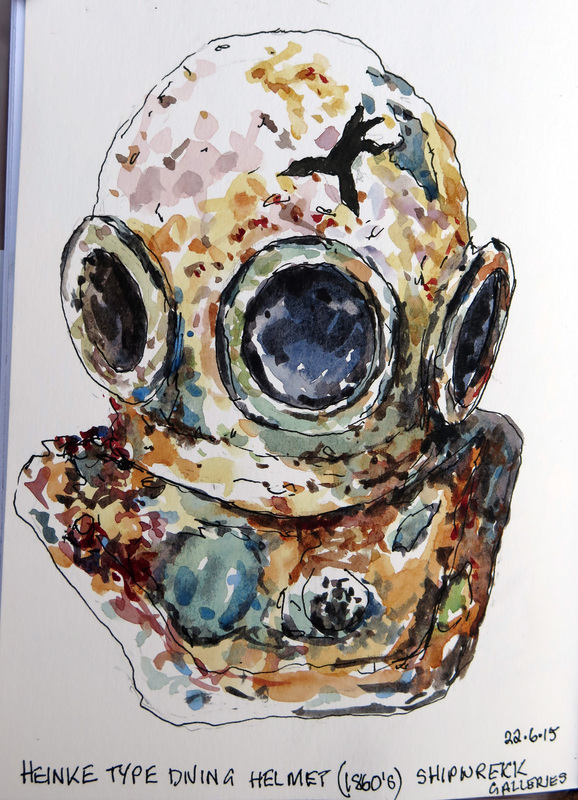 This diving helmet caught my eye… encrusted with sea corals and with patches of verdigris it was interesting to paint, although the low light throughout the museum made it a little more challenging to pick out colours. I had to stand to paint this one, holding my sketchbook in one hand, palette clipped to the other side leaving the other hand to apply the paint with waterbrushes and a sweatband on my wrist for brush cleaning. 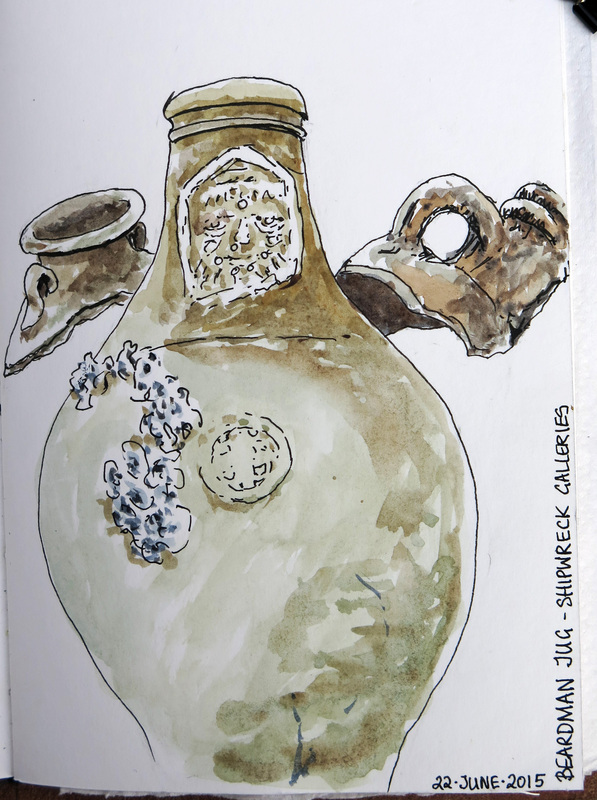 Next I moved to the upstairs part of the museum, to a section of pottery and everyday objects salvaged – some re-assembled, others only in pieces. This stoneware jug is known as a “bearded man” jug as it has a bearded face carved into the neck of the vessel, apparently it was a German traditional design (Bartmann). A couple of pieces of other stone jars are on either side. These are our two chooks Emily and Chirp (Poppy is sadly no more) who scratch around in a section of our backyard. 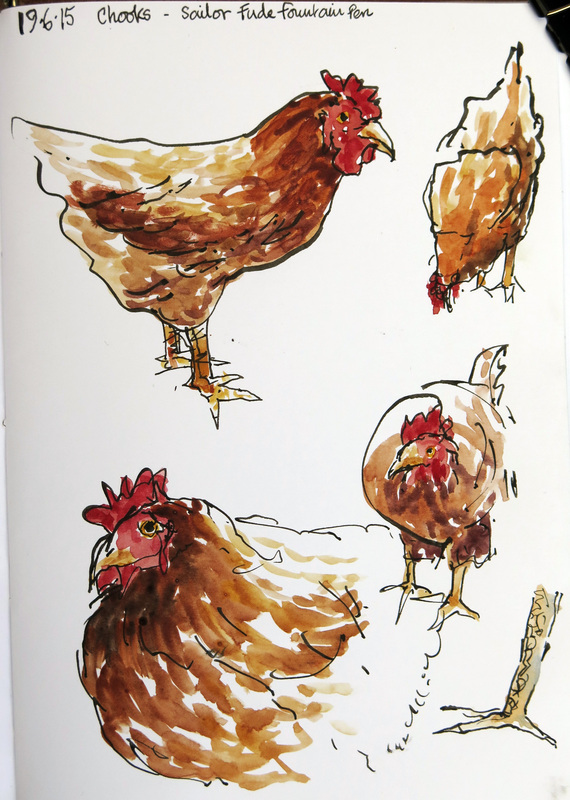 They were really hard to draw as they never stop moving… I watched them for fifteen minutes hoping that they would settle down and be still but I think they only know me as the food provider – they always get excited when I approach expecting to be fed some kitchen scraps. 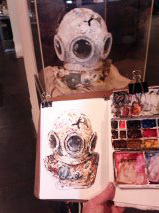 I did the drawing with my new toy…. a Sailor brand “Fude” fountain pen from Larry Post. 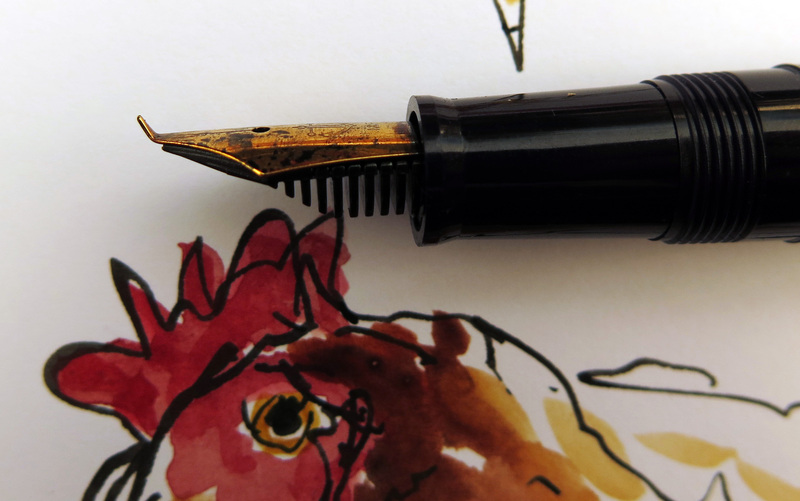 It’s a fountain pen with a nib bent up at 55 degrees which gives varying line widths depending on how far you tilt it from vertical position….It’s rather weird to draw with (it was created as a writing pen to mimic Japanese brush calligraphy). Bright red cranes with lots and lots of containers stacked up on the North Quay wharf at Fremantle (Freo to the locals). Lots of semi trailers loading and unloading, rumbling along the roads. Sketched today from a car-park on Port Beach Road opposite the container depot, surfers behind me enjoying the good swell rolling in. Size A6, about 1 hour. After the river picture I had become rather cold sitting under a shady tree so moved across the park into the sunshine and out of the wind. 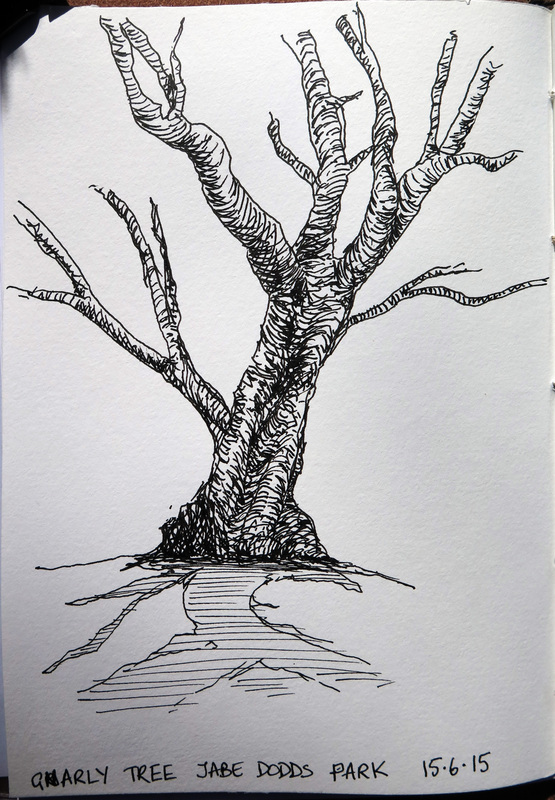 A lovely old gnarly tree was sitting waiting to be drawn, I only had 15 minutes left so a quick fountain pen sketch was necessary.